First and foremost, I'll start by saying that I'm not the world's best sewer but I can sew to the point where it looks presentable and gets the job done. I am some what of a DIY person at heart. I love finding cheap and effective ways to make my life simpler. 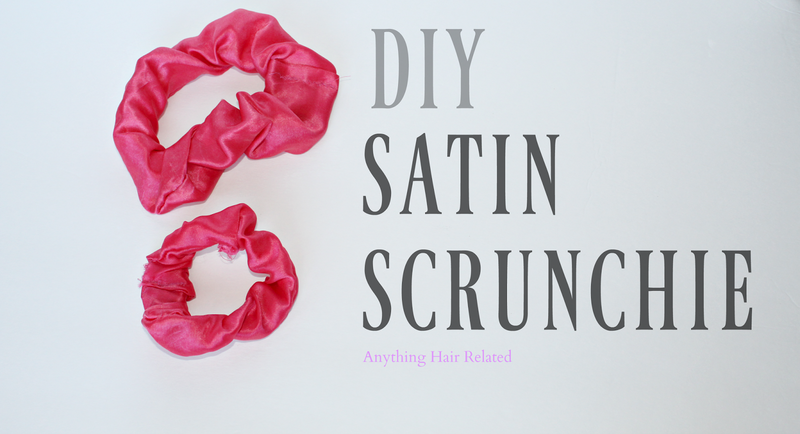 Today I want to share with you how I make my own satin hair scrunchies. They come in handy when I go to sleep at night and I want to put my hair in a pineapple. 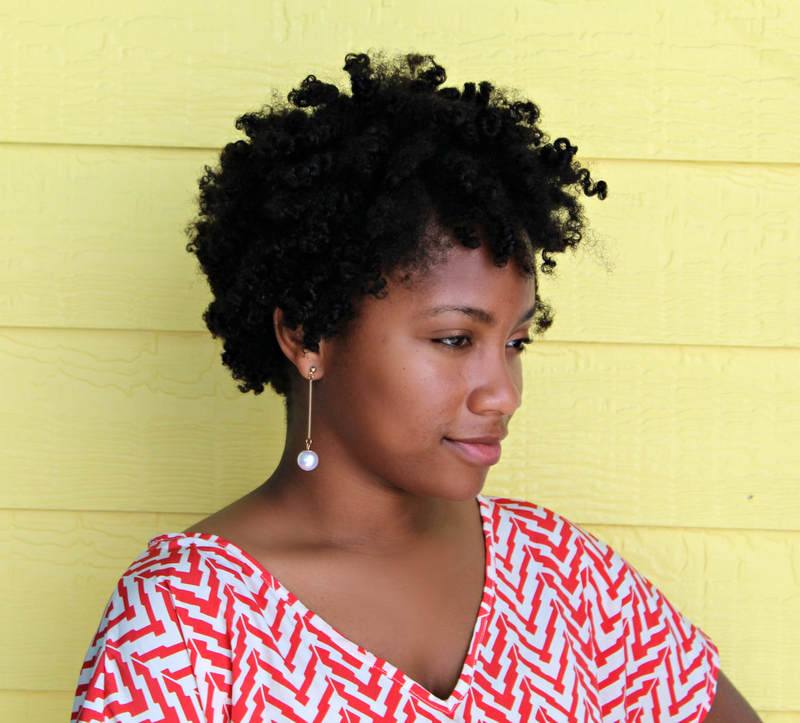 Also, now that my puff is getting larger, I can get away with wearing them in my hair throughout the day. Of course, the hot pink scrunchie is not an everyday wear out of the house option, but I use the pink satin mostly for tutorials because it's easy to see. Also, I have a ton of pink satin fabric to spare. Here are the materials that you will need. I sewed this project with a sewing machine but this scrunchie can be made without one and turn out exceptional. 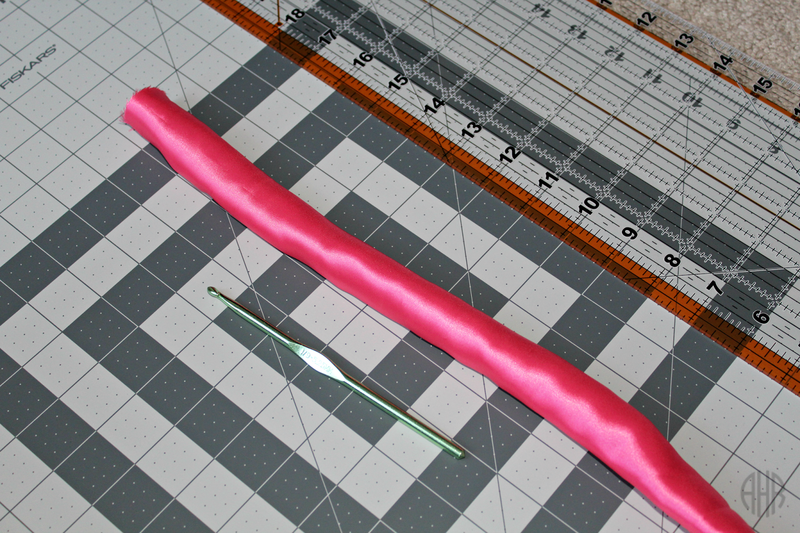 For starters, I measured a piece of fabric that was approximately 16 inches long and 4 inches wide. The fabric was a little more that 16 inches long but the longer the fabric, the more scrunch or stretch your scrunchie will have. Next, I took my satin fabric and folded it in half lengthwise, making sure that the shiny side was facing inward and the dull side was visible. 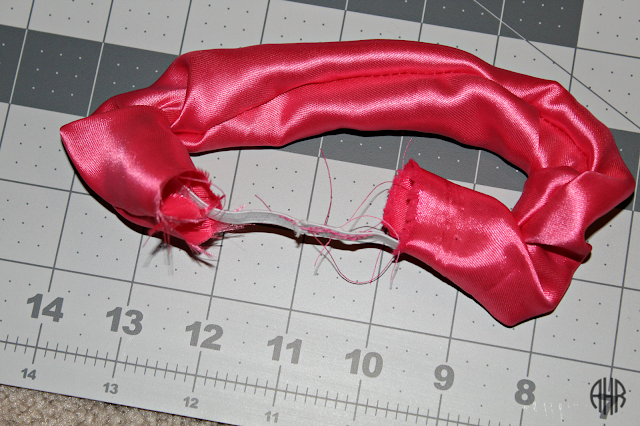 Once the satin was lined up evenly in half, I stitched a 1/2 inch seam all the way down the length of the fabric. Don't be alarmed if some of the edges didn't line up or if your stitches don't seem as consistent (if sewing by hand). I promise that the finished product will be the same. 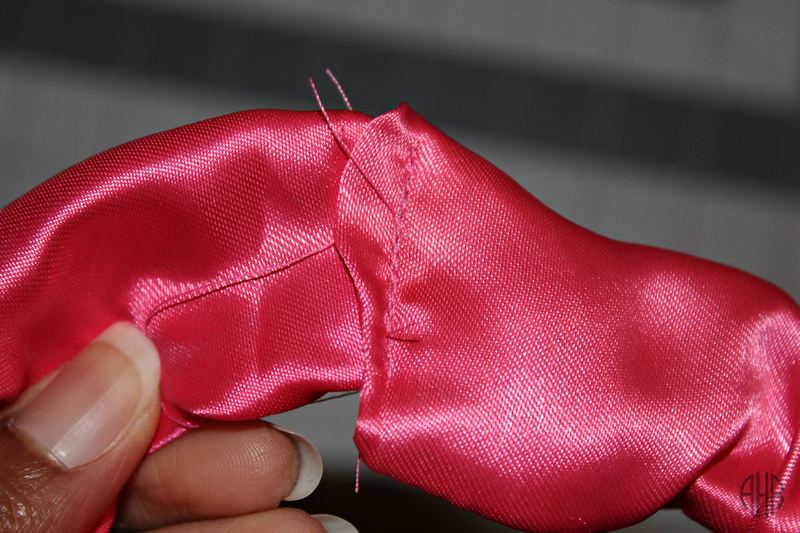 Once you have your fabric sewn together, you can begin to turn your fabric to the right side or the shiny side. 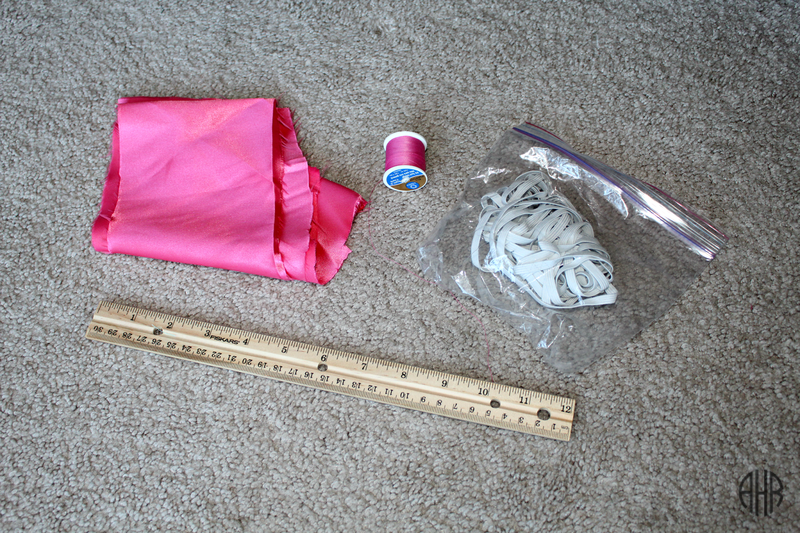 This can be done by taking a safety pin and pinning it to one end of the fabric and pushing it to the other side. I like that way the best but I didn't have one at the time, so I used a crochet hook to push my fabric through to the other side. Now your per-scrunchie should look like a long tube (shown below). Now that the shiny portion is showing, take a piece of elastic that is cut to half the size of the length of your fabric and add two inches to it. For example, the length of my fabric is 16 inches and half of it would be 8 and adding two inches would yield 10 inches. The extra two inches just supports the fact that you lose an inch or two when you tie a knot in your elastic toward the end. I chose to sew my elastic together but I have other scrunchies that I've tied the ends and the result is the same. My sewing isn't pretty in this photo but it will be hidden by the fabric. 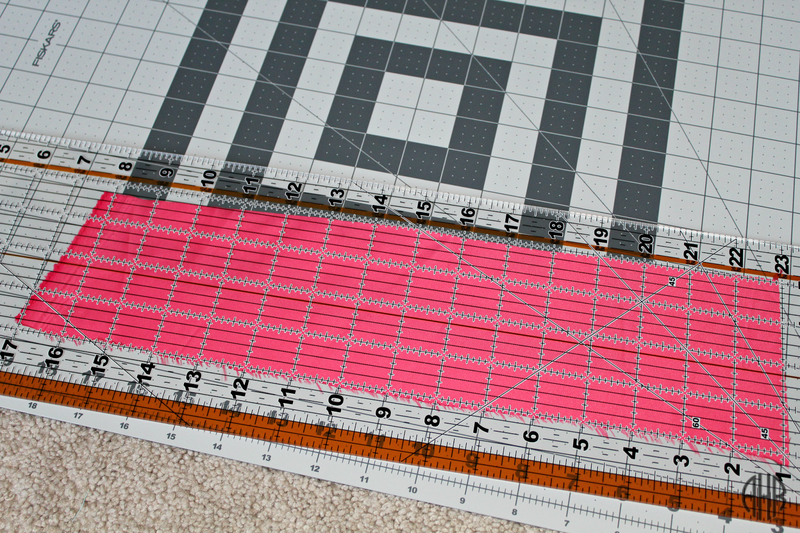 Lastly, take your fabric and overlay one side of fabric on top of the other. Remember to fold in any frayed pieces for a more polished look. 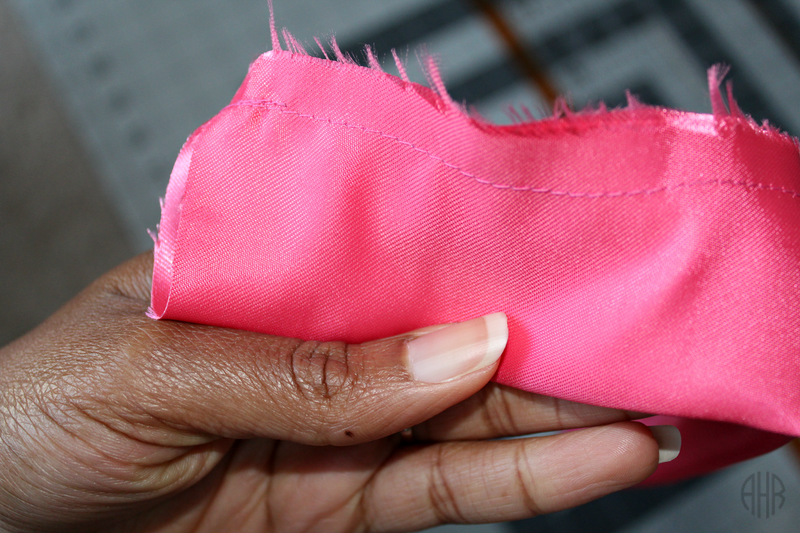 Finally, sew a straight stitch over the two layers of fabric to create your scrunchie. 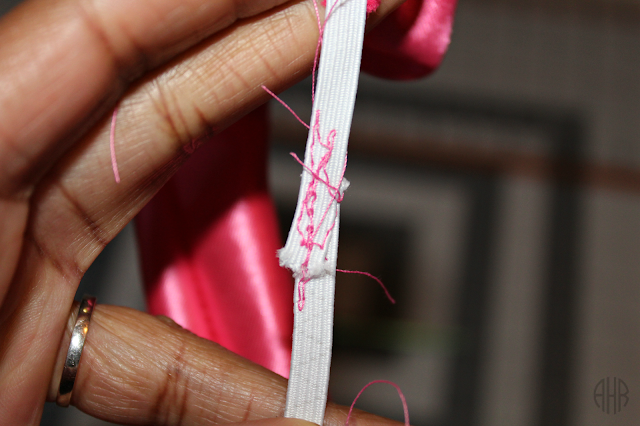 Also, trim away any thread left sticking out. That's it! This is a fast and easy project and you can make tons of them from a yard of satin fabric. Not only will you love them but you can make some for your coworkers, friends, and family. 2 comments on "DIY Satin Scrunchie "
Wow I have been looking for satin scrunchies forever. I am going to have to pull my sewing machine out and dust it off. You make it look easy. I need to make the hat and scrunchie. Thanks for the tutorial. Thank you and no problem! Thanks for commenting and stopping by.